The Soviet Union’s demise set Estonia and Belarus on opposite paths at the same moment in history. 25 years on, the results are clear. 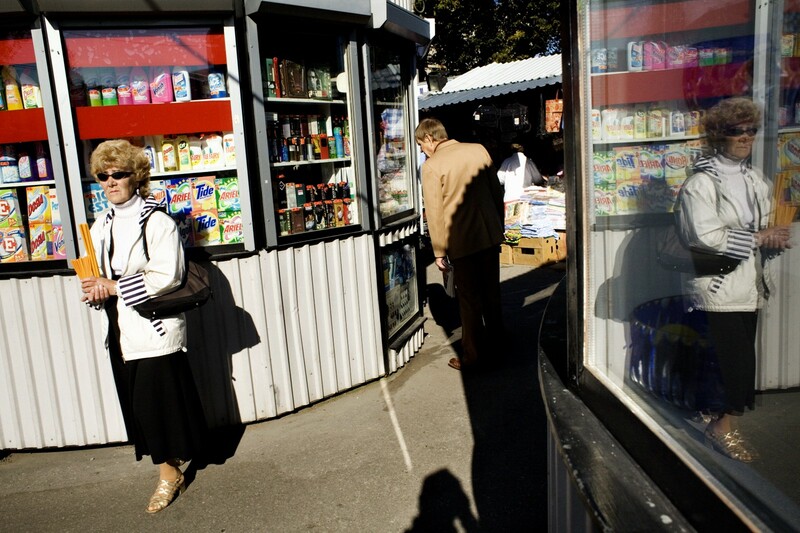 Photographer David Hogsholt visited Estonia in 2006 to photograph the transformation of the former Soviet bloc country 15 years after liberation. 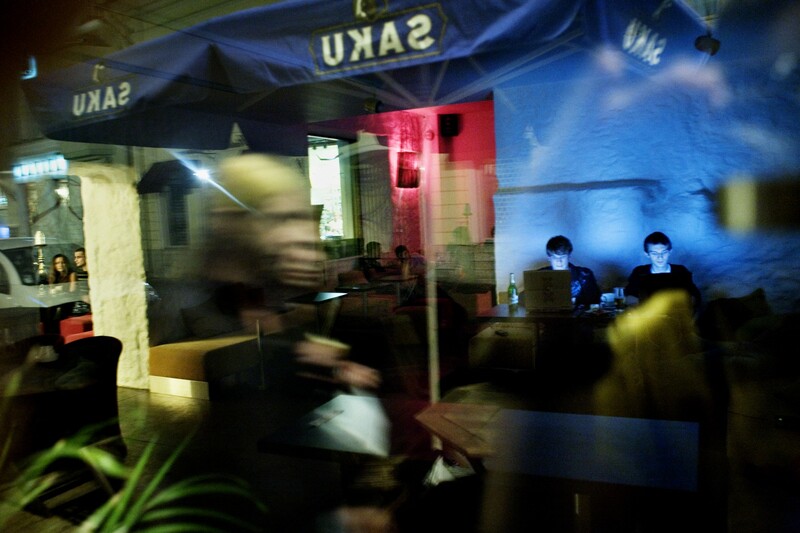 Here, in the first of five of his color images included in this essay, students take advantage of the free wireless in the cafe popular in Tallinn. 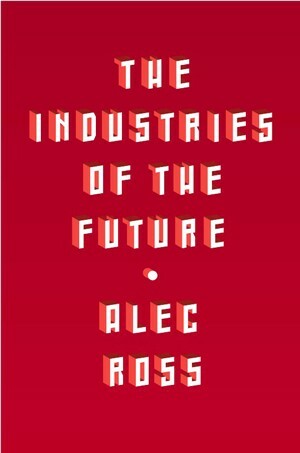 This passage is excerpted from my book, The Industries of the Future (Simon and Schuster, 2016). Rarely do countries and societies have the opportunity to make a simple, binary choice about whether they are going to be open or closed. But that is exactly what happened after the dissolution of the Soviet Union and the reestablished independence of Estonia and Belarus. The two countries are separated by just a few hundred kilometers west of Russia, but their trajectories could not be more different. Estonia is “The Little Country That Could,” the title of a book by the first prime minister of Estonia, Mart Laar, which explained the country’s rise from ruin at the end of Soviet occupation in 1991 to become one of the most innovative societies in the world today. Following Estonia’s independence with the collapse of the Soviet Union, its economy was left reeling. Everyday life for most of the country’s citizens was dire. Its currency was stripped of any value. Shops were empty and food was rationed. The gas shortage was so bad that the tattered government planned to evacuate the capital of Tallinn to the countryside. Industrial production dropped in 1992 by more than 30 percent, a higher decline than America suffered during the Great Depression. Inflation skyrocketed to over 1,000 percent, and fuel costs soared by 10,000 percent. The only system left working was the informal market, which, along with weak legal protections and unprotected borders, facilitated an increase in organized crime for Estonia and its neighbors. This was happening right around the time that Silicon Valley was about to take off with the advent of the commercial Internet. The focus on fostering an innovative business culture rooted in openness was reflected in the government’s second stage of reforms. 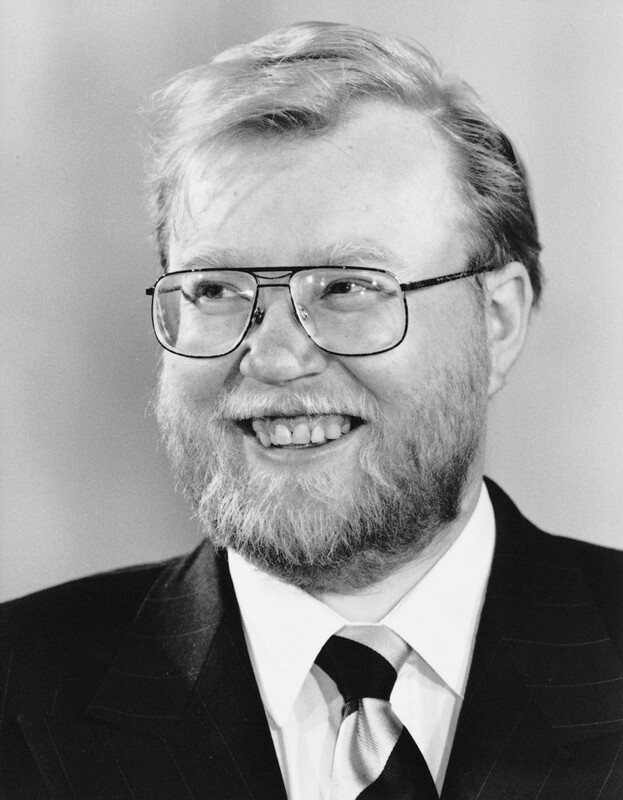 After the economy had been stabilized — inflation had dropped from 1,000 percent in 1992 to 29 percent in 1995 — Estonia opened its doors to the world economy. It reduced trade tariffs and ended all export restrictions, turning the small country into a trading hub. The government also reached out to foreign investors. The citizenship law was amended to provide equal civil protection to resident aliens. Estonia passed laws to ensure that foreigners could purchase land. All special privileges for existing investors, many of them holdovers from the Soviet era, were abolished in order to ensure a level playing field for new investors. When the Soviet Union collapsed, fewer than half of Estonians had a telephone line. The Finnish government, in a gesture of philanthropy, offered Estonia its analog phone system for free as the Finns upgraded to a digital network. The Estonians declined, choosing to bypass analog telephony and move straight to a digital network of their own design. As it developed its own government, it skipped the typewriter-and-paper stage and began putting its services online from the outset. Every school in Estonia was online by 1998, just four years after the birth of the commercial Internet and six years after widespread fuel shortages and breadlines. In 2000, Internet access was legally enshrined as a human right by parliament. 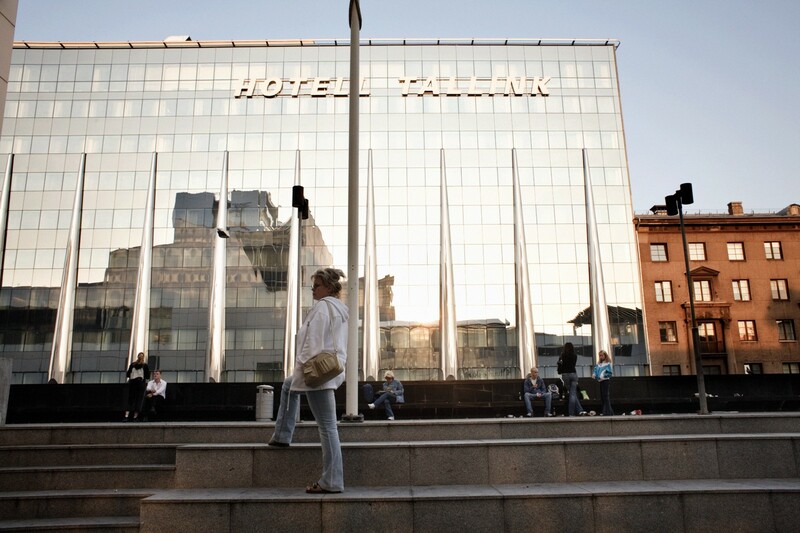 Estonia quickly became a center for global investment. The country received more foreign investment per capita in the second half of the 1990s than any other central or eastern European economy. This investment allowed Estonia to upgrade its technological and industrial base, and laid the ground for an innovation economy. Since independence, Estonia has been led by technocratic governments that have further opened the economy. In 2008, under President Toomas Ilves, Estonians voted to join the European Union (EU) and have since adopted the euro. As part of the EU, the Organization for Economic Cooperation and Development, and the World Trade Organization, Estonia ranks as one of the most globally integrated eastern European economies. The strategy was one of near-radical openness combined with an orderly and disciplined framework for how and when to open up the economy. The result is that Estonia has achieved a standard of living far beyond that of 20 years ago. Its GDP of over $25,000 per capita is 15 times what it was at the fall of the Soviet Union and ranks number one among the fifteen former Soviet republics. The real success of Estonia is reflected not only in these statistics, but also in its place as one of the world’s leading centers of innovation. Estonia has not produced a centi-billion-dollar company like Google, but it has achieved some notable successes, including Skype. 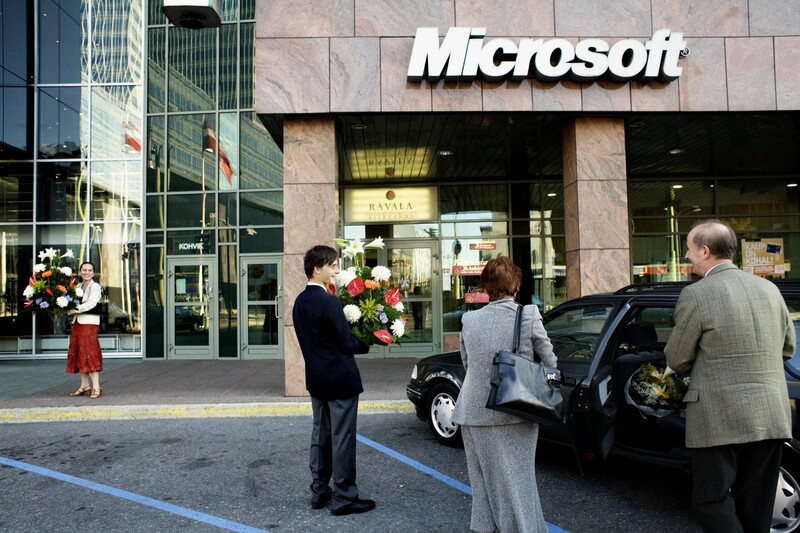 More significant, it has innovated in a way that every place in the world, including Silicon Valley, should envy. In doing so, it has improved its civic and political life in a way that positions it as well as any place in the world for the industries of the future. 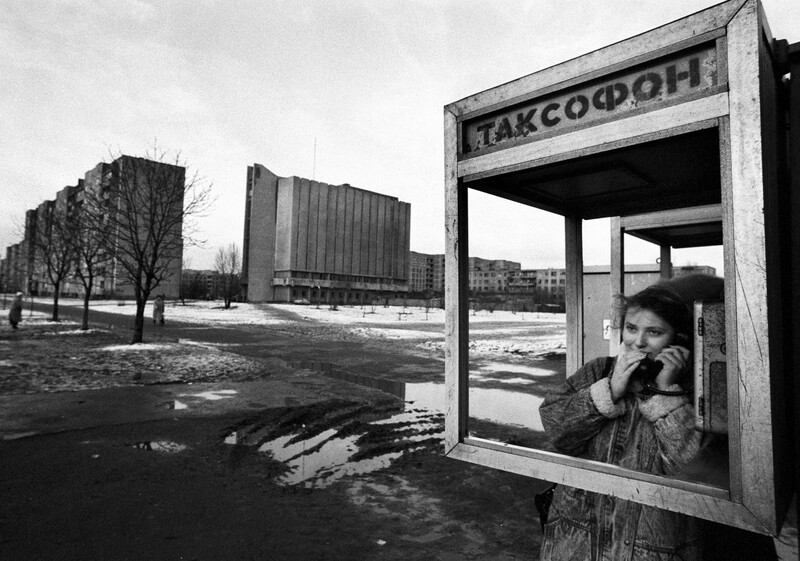 A woman in a telephone booth in Minsk, Belarus in 1995. Estonia and Belarus were in nearly the same position following in- dependence and made opposite decisions about their future. While Estonia opened up, Belarus closed off. In economic terms, Lukashenko is a neo-Luddite — someone who simply does not get the modern world. He owns the economy as much as he does the political system, even if the Belarusian economy does not amount to much. A former farm manager, Lukashenko is the single key player in its economy. Most businesses are state owned — effectively Lukashenko owned — and output and employment are subject to strict administrative controls. Around 40 percent of industrial enterprises and over 60 percent of agricultural firms incur losses. Belarus’s currency is the Belarusian ruble, which makes the Russian ruble look strong by comparison. Belarus is still a land producing practically no data. It is a remnant of the 1970s, with typewriters still in use in a large percentage of businesses and government offices. Instead of using “serf-like” robots to replace manual labor, Belarus is stuck in an era where people are still effectively serfs. Belarusian laborers still toil on collective farms or in outdated industrial manufacturing. They do the dull, dirty, dangerous jobs that robots are doing in more advanced economies. The high-water mark for Belarus and the Internet is a social media–savvy graduate student in Massachusetts named Evgeny Morozov, who writes neo-Luddite screeds against American technology companies, advancing the official views of Russia and Belarus. When I first arrived in Estonia and drove into the capital city of Tallinn, I noticed that the headlights on our car lit up reflectors on all the pedestrians we passed. Bracelets and necklaces were lighting up like the stripes on the vests of road workers working at night. One of the first people I met was Karoli Hindriks, the CEO of Jobbatical, a company that blends the concept of a job and a sabbatical, matching employers and talent for short-term jobs that might involve sending a software developer from Sweden to Thailand for a three-month “jobbatical.” I asked Karoli why she and everybody else on the street was wearing reflective clothing, and she told me that when it becomes dark, it is the law in Estonia that all pedestrians wear some form of reflective clothing for safety reasons. She smiled and told me that she became an inventor at age 16, creating pedestrian reflectors that could be used in clothing and jewelry, and she now holds several patents and international trademarks for her designs. This was representative of what I have seen during all of my time in Estonia: extreme order combined with invention and design. President Ilves is not quite like any other head of state I have encountered. He has a distinct look (a hip buzz cut with three-piece suits and bow tie) and interpersonal style — one part tough guy, one part technology geek. Ilves was raised in the diaspora (New Jersey, actually) and returned to Estonia after the fall of communism and Estonia’s reestablished independence from the Soviet Union. In the hundreds of thousands of miles that I traveled for the State Department and the many meetings I had with foreign dignitaries, Ilves struck me as the most knowledgeable of the world’s 196 heads of state on technology issues. Today Estonia is one of the most connected countries in the world. It has the world’s fastest Internet speeds and universal medical health records, something that the United States has been struggling with for years, with no end in sight. In 2007, Estonia became the first country to allow online voting in a general election. Ninety-five percent of Estonians file their tax returns online — doing so takes about five minutes. In December 2014, Estonia made yet another bold move, offering what it calls “e-residency” to any person in the world. As the country put more of its government services online, from incorporating a company (which happens at a world-leading speed, estimated at five minutes) to authenticating electronic signatures, it has seized the opportunity to position itself as a hub for digital government services. To become an e-resident of Estonia, you make one trip to the country (though it hopes to be able to operate out of its embassies in the future) to submit your biometrics and other personal data for verification. You pay the registration fee and receive a secure chip-enabled identity card. You can now use your Estonian e-residency for a variety of things, such as doing business throughout the EU and leveraging its online-only programs for contracting and tax filing. It’s a way to bypass other countries’ more expensive and less efficient systems. No more paperwork, lower taxes, and, if you own a business, all the freedom that comes with being an incorporated business in the EU. In a similar way to how other countries have created tax havens to benefit from large deposits in their banks, Estonia has established itself as an efficiency haven. Instead of facilitating criminal behavior as tax havens do, Estonia’s system is trying to make business more secure. The ideology behind it is rooted in good government. Among the benefits to Estonia is the additional tax revenue and more than $500 million in fees alone that it expects from 10 million e-residents over the next several years. Every leader I’ve spoken to about Estonia’s e-residency has the same one-word, three-letter response: wow. Ilves thinks that the advancement of robotics serves Estonia well by giving the small countries of the world the chance to compete on the global stage with actors like China and India. He told me, “It will increase our functional size tremendously because people don’t have to do things the machines can do.” Estonia has only 1.3 million citizens. Ninety-eight cities in China have a larger population than the entire country of Estonia. At the core of Ilves’s thinking is the fact that robots will enable significantly increased output per capita. How does a little country like Estonia compete in the same global marketplace as China, which has a labor force a little more than 1,000 times the size of its own? It takes advantage of the fact that robots enable a relatively small workforce to produce higher levels of output than would be the case in an all-human workforce. Estonia and China will never be equal competitors by sole virtue of their difference in size, but Estonia can compete at a level far above what its size would suggest by virtue of being cutting-edge in the field of robotics as both producer and consumer. Estonia has demonstrated how innovation in the industries of the future can do more than just generate wealth and employment; it can enhance our civic and political life. In this respect we should stop asking about the next Silicon Valley and start asking about the next Estonia. You can buy The Industries of the Future here. All photographs via Getty Images. Estonia images by David Hogsholt. Running for Governor of Maryland. Startup advisor. Obama Alum. Teacher. Author. Baltimore City Schools dad. www.AlecRoss.com Auth: T Hike-Hubbard, Treas.